Spaceman in Ely - An idea for the new Cambridge TV? I was glad that I’d made the choice to give up an armchair evening watching “Murder in Paradise” to hear about the new local Cambridge TV station, being set up by Peter Dawe, at Sue Keogh’s Creative Ely meeting. Peter Dawe is a serial entrepreneur who has worked with more than 80 businesses over 30 years, including the founding of Pipex and Internet Watch. Peter had had a brush with setting up a community TV channel in the past. His great achievement at the time, as he wryly remarked, was to lose money more slowly than other equivalent stations. Community TV disappeared when the funding and support was dropped. But now, Offcom is again encouraging local TV. Seizing the opportunity, Peter gained the licence for Cambridge TV. There would be a free view signal from Madingley and the potential for one from the Sandy Heath transmitter. The anticipated launch will be in summer 2014 at the earliest but must occur no later than September 2015. In a humorous link between the gamble and its location in Cambridge, a possible name is “Punt TV”. Peter’s Punt TV has an obligation to provide 11 hours of locally produced programmes a week and he hopes to be able to share local news items from the BBC diary. That just leaves another 157 hours per week to fill! So how does Peter propose to do this? Whilst there will be a small team of five professionals, the reality is that there is no money in local TV. One route is to give trainees an opportunity to learn about the sector. But most of the entries will be high-quality submissions by contractors who are willing to self-fund their activities. A key factor would be to provide weekly content. And what you get for this? Well initially there is going to be no charge for broadcasting. There will however be quality control. Good TV broadcasts don’t just require content, they need excellent lighting and sound recording. Peter and his team will be screening incoming material, presumably via a wormhole in space to screen one week’s TV simultaneously in a parallel universe. Who’s the audience? Well, the people of Cambridge, with above average income and a high proportion of the population with at least one degree. An audience that is willing to watch more challenging and interesting programmes. How about local business news, hot topics from university research and local documentaries, broadcasts of concerts and talks. “Yes, at last! Snob TV!” was my wicked thought, eliciting a chuckle from the audience and resonating in the discussion afterwards. I personally really enjoy interviewing people and bringing the best out in them. Before returning home from an exhilarating evening, I still had one last task to do. It was a cold chill night, and the Ely waterfront reflections in the river called out to be photographed. For added interest, I had lured Jon Torrens out with me. 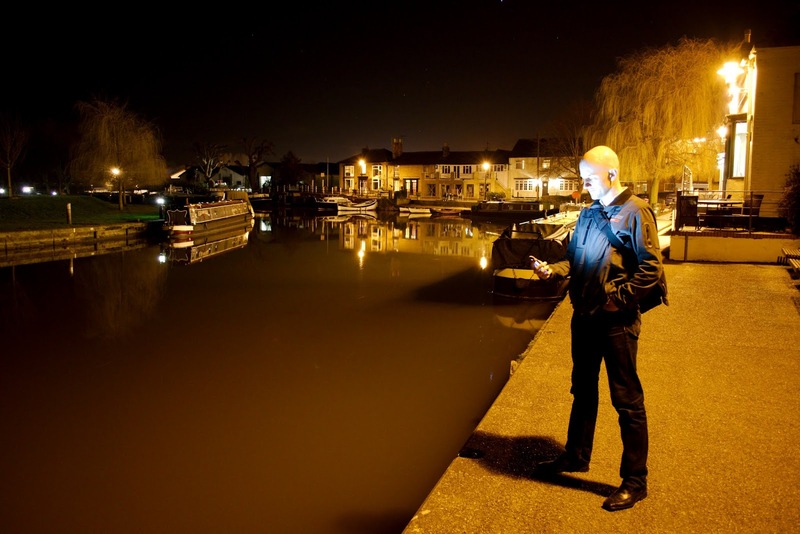 Illuminated by the light of mobile phone, he provided a fantastic eerie counterpoint to the night-time river reflections. Thanks Jon! Would you like to be the first to read the next post from this blog? Sign up on the right.